Career Missionary since June 2012, serving the Susu people of Guinea, West Africa. 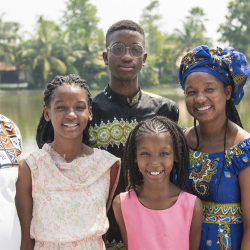 Fredrick Bankole and Isatta Bintu Coker and their children have been bringing the gospel of Christ to the Susu people of Guinea, West Africa, since 2002. Forging friendships with their largely Muslim Susu neighbors, the Cokers enjoy rich theological discussions with many people who have never before considered the witness of Issa (Jesus). The Cokers are working to form these interests into the core of a future church among the Susu.